Love the Barcelona furniture, but don't have millions to spend? 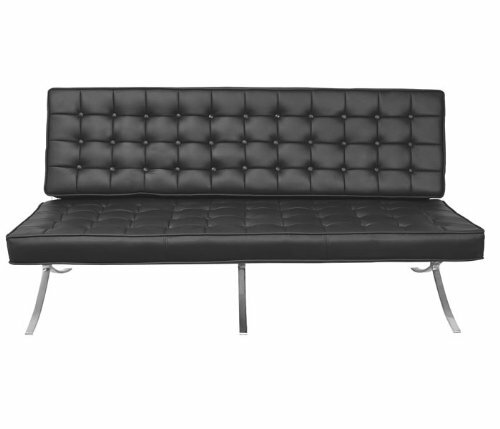 Pick up a cheap Barcelona Couch reproduction today! The iconic Barcelona furniture has endured for nearly a century as a symbol of modern design and understated class, racking up awards and fans all over the world for its clean lines, simple construction, and royal heritage. The original design has inspired accompanying pieces, so if the original chair isn't enough for you, pick up a Barcelona couch reproduction and own a piece of modernist history in your own home! 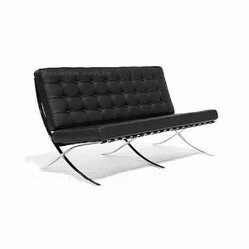 The Barcelona Chair, daybed and stool were designed by Ludwig Mies van der Rohe way back in the 1920s for a giant party called the International Exposition in Barcelona, Spain. That's how the chair got its name. There was never a real sofa, however. Just the chair, bed and stool. 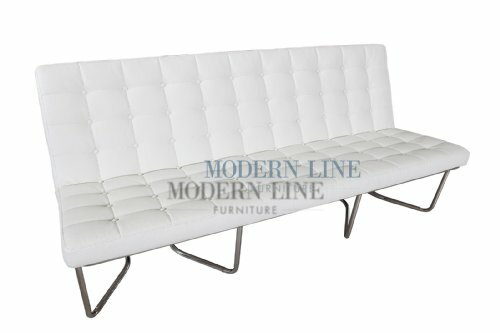 The couch was merely a design inspired by the original piece, emulating the style, but elongating the dimension. So there is no such thing as a "Barcelona Couch Reproduction," really, but since there was no such thing as a Barcelona Couch in the first place, there's no such thing as an authentic one, either. There is, however, the Barcelona Daybed, which is merely a twin-size mattress made of leather with an attached pillow, which is sometimes called the Barcelona Sofa or Couch. Check out a Barcelona Daybed Replica if that's what you're after. Well, now that that's all out of the way, let's get shopping! You'll notice that the world has, for some reason, decided to produce two versions of the Barcelona sofa. One is styled with the stainless steel support beams of the Barcelona Chair and its reproduction models, while the other one also uses stainless steel support beams, but which look a bit more like the legs of the Barcelona Table, also one of the original pieces. You'll notice the difference in the product listings below, so take your pick of which style you want to complement when you buy one. The couch, of course, will be the epicenter of any living room, but the rest of the pieces are also available for purchase online, both in cheaper replica versions, or "authentic" trademarked pieces from Knoll. The price difference is usually in the neighborhood of an extra digit, which can make quite a difference to budget shoppers. Just remember that there is no "real" thing anyway, since the original designer is long gone, and the current production model is a somewhat updated version anyway. But explore the links below to collect them all! Looking for a cheap Barcelona daybed replica? Pick up a reproduction model for sale and enjoy this piece of history at a great price! 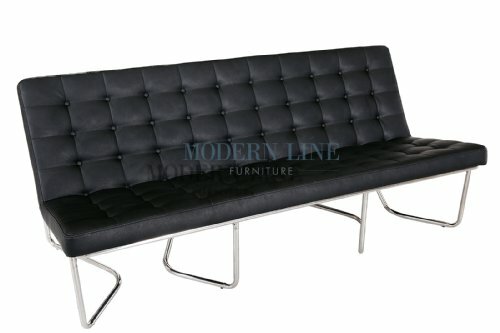 Looking for cheap Barcelona Chairs online? Buy a cheap reproduction Barcelona Chair on sale to get the best price, and enjoy this modern classic at a bargain. If you're one of the many fans of modern furniture, check out the options for cheap Barcelona ottoman reproductions and replicas and pick one up today! Why Lift Top Coffee Tables are Best? Bean bag chairs fit in a variety of decors and spaces. Comfortable, fun, and relaxing, bean bags, with their array of designs, reflect the personalities of their recliners. Contemporary lift top coffee tables are designed to appear chic and trendy taking less space and ability to retrieve the shoved away things. Cool and Funky chairs for teens like these will help transform your teenager's bedroom from a drab space into a 'fab' place they'll love.